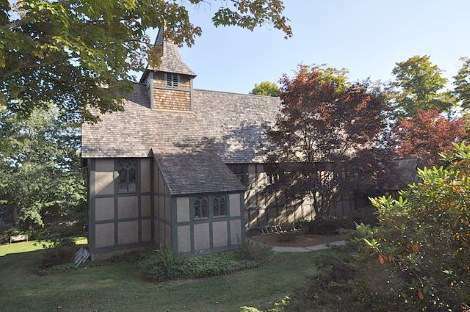 Henry Vaughan didn’t leave much in the way of paper records, but he did change the face of Puritan New England with dozens of striking and much-admired Gothic Revival churches, schools and mansions. Born in Cheshire, England, in 1845, Henry Vaughan likely trained with British architect George Frederick Bodley, the leading architect working in the Gothic Revival style. Vaughan worked as Bodley’s head draftsman. 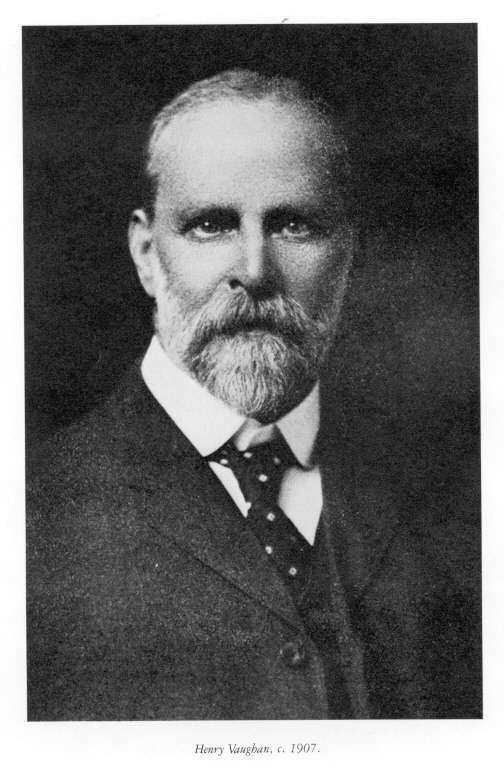 In 1881, 36-year-old Henry Vaughan came to Boston representing Bodley. He would design the chapel for the Sisters of St. Margaret, associated with the Anglican monastic order, Society of St. John the Evangelist. Very few Gothic Revival architects had his training and sophistication. Whether he intended to stay in America isn’t clear, but he quickly launched a successful architectural career -- though he never sought commissions. The Episcopal church gave him plenty of work. 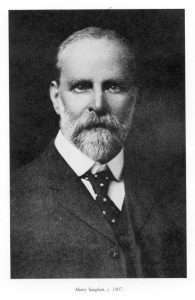 So did eccentric millionaire Edward Searles. Henry Vaughan’s style of work was as much a throwback as the buildings themselves. When Vaughan was working on the Washington National Cathedral, recalls an employee, everything was done in a very 'old time way.' He viewed the telephone as an intrusion, and the head draftsman occasionally typed out a letter with one finger. Described as shy and withdrawn, Henry Vaughan attended daily Mass. He lived in a boardinghouse on Beacon Hill, had few friends and rarely appeared in public. After dinner, he always returned to the office to feed the mice with leftover rolls. His employees were forbidden from coming in then because they might disturb the creatures. Henry Vaughan worked on two of the most important cathedrals in the United States, Washington National and St. John the Divine. 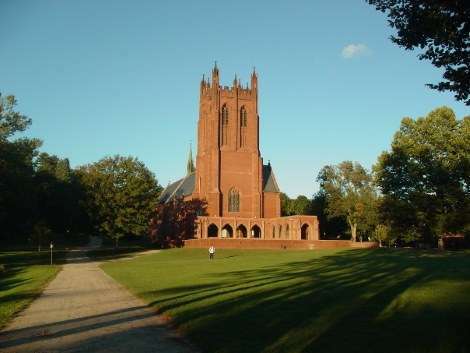 His chapels at the Groton and St. Paul’s schools are considered two of the most beautiful Gothic churches in America. Though Henry Vaughan’s architectural designs dated to the Middle Ages, they were actually quite new for the region. New England had its roots in Puritanism, but the old hatred of Catholicism and High Anglicanism was fading. When Henry Vaughan died in 1917, Episcopal Bishop William Lawrence suggested a change had come over the people. “Many of them are turning back to the prayer book, the dignified forms and rich associations of the church of our English ancestors,” he wrote in Vaughan's obituary. Here, then, are six Henry Vaughan buildings, one in each state (plus a few bonus mentions). If you know of other Henry Vaughan buildings worth mention, please share them in the comments section. 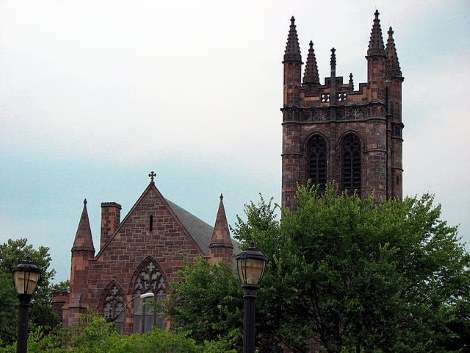 The Gothic Christ Church is a landmark in downtown New Haven. It combines a ‘bells-and-smells’ high Anglo-Catholic tradition with a soup kitchen and a residence for homeless young people. Henry Vaughan designed Christ Church with a stone tower modeled after Magdalen College in Oxford. He chose the artists to decorate the interior, including Johannes Kirchmayer for the wooden carving and C.E. Kempe to create the stained glass windows. The high altar was inspired by Winchester Cathedral and St. Alban's in England. 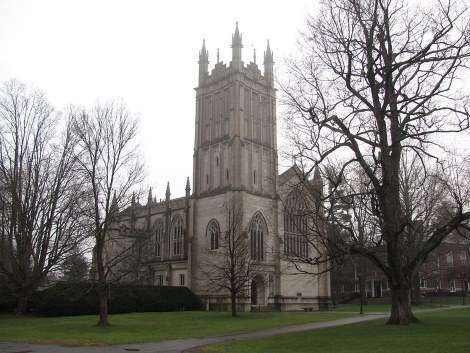 “It could not be taken for a country church; yet is pure and scholarly Gothic, both modern in feeling and medieval—the enduring style adapted to new conditions,” wrote Cram. Christ Church holds Solemn High Mass at 11 a.m. every Sunday. A large crowd comes to Compline, or night prayer, at 9 pm September through May. Christ Church is the headquarters for the North American branch of the Society of Catholic Priests, Episcopal clergy who practice the Anglo-Catholic tradition. 70 Broadway, New Haven, Conn.
St. Andrew’s, Henry Vaughan’s first parish church, is one of at least two notable churches in tiny Newcastle, Maine. 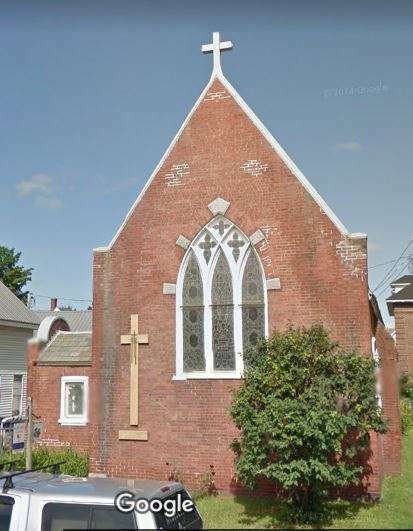 The other is New England’s oldest Catholic Church in continuous use, St. Patrick’s, proud owner of a Revere bell. Henry Vaughan sailed to the United States in 1881 on the packet ship American Clipper, owned by Capt. and Mrs. William Glidden of Newcastle. Vaughan probably met them on the voyage. Glidden and his partner owned clipper ships that sailed between Boston and San Francisco starting in the Gold Rush of 1849. The Gliddens commissioned Henry Vaughan to design St. Andrew’s, and he lived with them while he worked on the church in 1883. The charming half-timbered stucco church lies on the banks of the Damariscotta River. Its simple exterior is a rare example of rural late English Gothic, the first cottage Gothic Revival church in the United States, according to Vaughan's biographer William Morgan. Rich, colored stenciling and carved woodwork decorate the interior. Henry Vaughan had insisted the nave and chancel ceiling be stenciled according to his design. The vestry wouldn't pay for the work, so Vaughan painted it himself over an entire summer on his back. 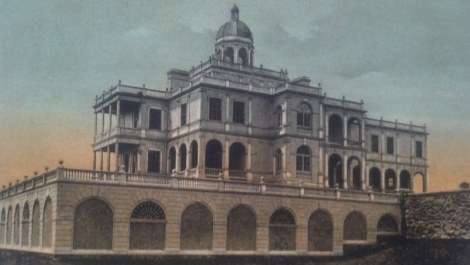 In 1908, a fire devastated downtown and the Newcastle National Bank found a temporary home in the St. Andrew’s parish house. The church has a Henry Vaughan Fund to maintain and preserve the church; you can actually buy a Henry Vaughan gift card. Edward Searles, an interior decorator born in Methuen, Mass., hired Searles for almost as many projects as the Episcopal Church did. Searles married the fabulously wealthy widow (and much older) Mrs. Mark Hopkins one year before she died. She left him a quarter of the Southern Pacific Railroad and $21 million in property. Searles indulged his whim for building on a grand, even excessive scale, almost always with the help of Henry Vaughan. Searles sponsored dozens of projects—schools, churches, castles, organ cases, tombs and remodeling. Henry Vaughan expanded Searles’ home in Methuen into a huge estate, including a 74-room house and chapel surrounded by castle walls. Today the estate, Pine Lodge, houses Presentation of Mary Academy, a private Catholic high school. Though rarely seen in town, and then only in his gold-trimmed Pierce-Arrow, Searles made many gifts to his birthplace. He paid Methuen’s $65,000 debt and gave it thousands of trees, a monumental statue of George Washington, three churches, the railroad station, a battlemented bridge across the Spiket River, the Red Tavern, a boardinghouse called the Hayloft, the John Hancock Masonic Lodge, the Central Grammar School, Searles High School, two family tombs, an organ factory and the Serlo Organ Hall. Henry Vaughan designed much of it, including the high school. From the outside it looks like a Jacobean prodigy house, a large, showy mansion built by English nobles. It cost $1 million and required imported Italian workmen. It now serves as Methuen Town Hall. Henry Vaughan also built one of his masterpieces in Massachusetts, but not for Edward Searles. St. John's Chapel at the Groton School. Methuen City Hall, 41 Pleasant St., Methuen, Mass. 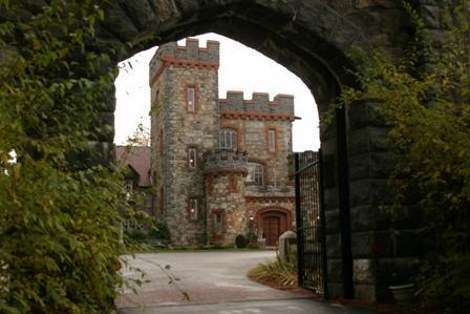 Searles Castle in Windham, N.H.
By 1905, Searles fixated on one final obsession. He wanted a proper castle. Searles bought 1400 acres of land in Windham, N.H., to put it on. Searles had discovered family ties to the Harcourts in Oxfordshire, England, who had a 15th-century manor house, Stanton-Harcourt, mostly destroyed. He supposedly sent Vaughan to England to draw plans of the ruined section of the original house. Vaughan designed Searles Castle in Windham as a one-quarter-size replica of the English castle, complete with battlements and portcullis. 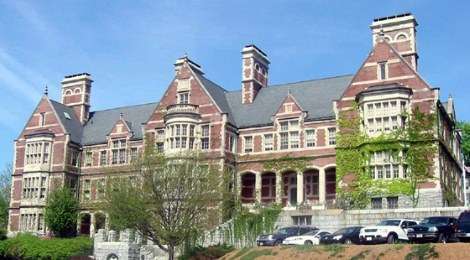 The Tudor Gothic castle was built of granite, fieldstone and dark red sandstone, most of which came from Searles' quarries in nearby Pelham, N.H. It took nearly a decade to finish the castle and $1.25 million to furnish it. Eight-foot walls protected the castle from intruders. Chapel of St. Peter and St. Paul at St. Paul's School in Concord, N.H. Though Searles Castle is one of the most imposing buildings Henry Vaughan designed, the Chapel of St. Peter and Paul at St. Paul’s School is his most important. The chapel influenced a long line of school and college chapels and inspired many young architects. “Had Vaughan died at, say, age fifty and had not lived to design many of his churches or Washington Cathedral, his place in the Gothic Revival in America would still be secure,” wrote Morgan. For early photographs of the chapel at St. Paul’s, click here. Searles Castle, 21 Searles Rd., Windham, N.H.
Searles commissioned Henry Vaughan to build a dream house on Block Island for him and his new bride. Construction began on White Hall in the summer of 1888 and finished in 1890. Searles spent over $1 million on the project, or about $24 million today. 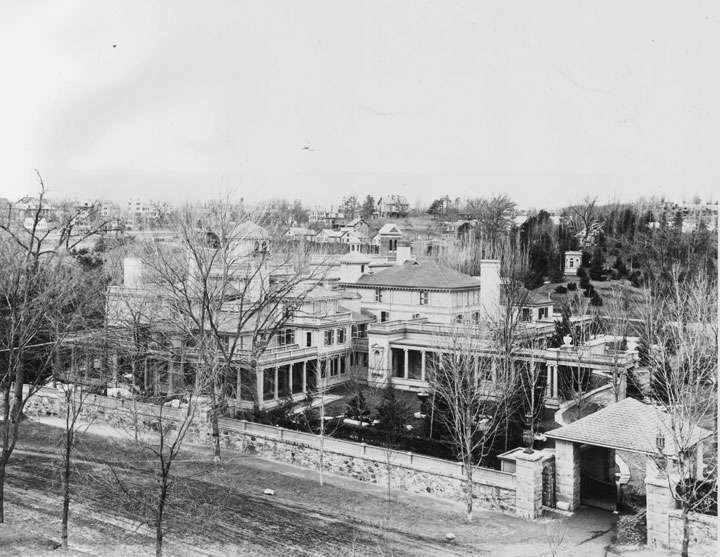 Vaughan designed the mansion as a ‘twin house,’ with each of the Searles having a separate identical side of the mansion. Rumors flew that the marriage was in trouble. An octagonal dome topped the mammoth white pine house inspired by early 18th century Palladian designs. The house, dubbed “Searles’ Folly’ and 'Mansion House' by the locals, overlooked a pristine beach. A hurricane blew off the dome during the finished house’s first winter. Mrs. Searles died in 1891, the year after the mansion was finished. Searles rarely visited White Hall after her death. Searles died in 1920, and White Hall remained empty. Over the years it changed hands until a fire burned it to the ground in 1963. Today, Rhode Island can only claim as Henry Vaughan’s work the chancel furniture for St. Stephen’s Church in Providence. It was only Vaughan’s second commission in the United States, and it cost $4,000, as much as the entire St. Andrew’s church in Maine. White Hall, Mansion Beach, New Shoreham, R.I.
St. Peter's Episcopal Mission in Lyndonville, Vt.
Henry Vaughan designed another small rural church in the northern Vermont town of Lyndonville, St. Peter's Episcopal Mission. The cornerstone for the simple neo-Gothic building was laid in 1898 on donated land. Today it stands in the midst of a modest residential neighborhood. 51 Elm St., Lyndonville, Vt.
With thanks to The Almighty Wall: The Architecture of Henry Vaughan by William Morgan.